So one time my family was driving north on I-75. It was one of those nights where someone has to ask "Are we there yet?" That particular night it was very rainy. A sort of Large Marge night if you will allow the Pee-Wee comparison. We looked for roadsigns to read through the rain on the window glass just to make out where we were. We were pretty far between any major town and if anything would have happened to us on the roadside it would have taken forever to get any place for help. This was in the time before cellphones. Anyway, at a certain point we saw a bright-colored something up on the left (west) side in our headlights. Here, in the middle of nowhere was a very large woman, in a traditional yellow raincoat, walking at a brisk pace. She had a look on her face that revealed some inner turmoil. She seemed somewhere between furious and maniacal, like she was in a private hell. Our first thought was that something happened to her car and we all looked around to see where she might have left a car but none could be found. The whole encounter had this air of strangeness to it. So many questions. Who was she? Where was she heading on foot at night in the middle of nowhere in the rain? At least she had a raincoat on, but by now she had to have been drenched. Normally my father would have stopped to help someone on the roadside, but this lady didn't look helpless. She just looked very angry and somewhat frightening. Soon after we spotted her we found a sign that announced something like 10 or 15 miles till the next city and though we kept looking at her she soon became a shrinking bright spot in our rear window until she had vanished entirely. We kept going with thoughts of that angry woman in our head, but things fade and by the time we hit the next exit we had probably mostly forgotten her. Then, some time later, after we had passed another town we began to see another yellow dot moving south again on the west side of the highway. 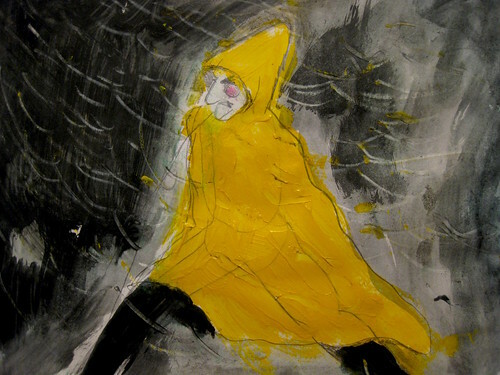 Again we saw a very large woman, marching stealthily in a giant yellow raincoat. As we got nearer we were startled to see what seemed to us to be the very same woman, the one from earlier that night. Now we had been driving north the whole time on a long straight stretch of highway and the woman we had seen earlier had been pushing south at a brisk pace. If both of these encounters had been instances of seeing two distinct people then they eerily looked alike and had the same gait and demeanor. But all the observable signals pointed to one thing. This was the same woman, appearing again, several miles north of her first location. But how?